is her contribution to the War of Independence. will change the course of her life forever. HANNAH THOMAS never thought she'd find herself tending twin lighthouses all alone on a Massachusetts' coastline. Widowed shortly after her husband joins the Continental Army, she ends up lonely for company and vulnerable to a man she fears. To assuage her loneliness, Hannah sends for her younger sister, Lydia. Hannah quickly realizes that she may have been better off alone since her sister is fiercely devoted to England and wildly obsessed with with Galen Wright, the man she wishes to never see again. Will Lydia's foolish ways lead to humiliation and devastation or healing and restoration? BIRCH MEREDITH crashes his ship on the rocky shoreline when Hannah purposely fails to light the lighthouses due to a rumored attack. Though a Tory, Hannah still saves him and keeps him in her home while his wounds heal. His mind set on seeking revenge for the murder of his younger brother, Birch wants nothing to do with the God Hannah loves. Yet, he can't deny the attraction he feels toward the radiant woman who glows as bright as the light she tends. Hannah enjoys the camaraderie she shares with Birch. However, she knows she must keep herself from falling for a man with a heart that's as hard as the rocks that destroyed his ship. Determined to stand strong and weather the storms of life that come her way, Hannah can't help but hold out hope that maybe someday she and Birch can have a future together. Is it possible that a handsome sea captain isn't all that he seems? Will he ever conquer the waves of vengeance that have flooded his heart and soul? Because I read so many Christian fiction books, I rarely remember individual titles. Several have stuck out over the years, though, and 2 of them have been Colleen Coble books: Abomination and Butterfly Palace. When I see new books by this author, I usually want to read them, especially if they're historical fiction. Coble fills her pages with suspense and isn't afraid to make her protagonists suffer. 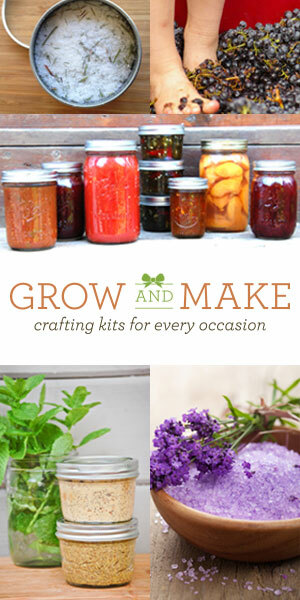 And according to Gail Carson Levine in her book, Writing Magic, " . . . it takes a mean author to write a good story." 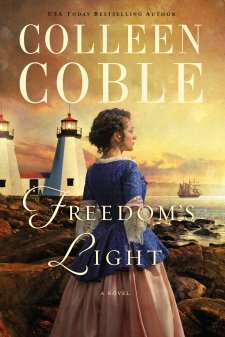 I wanted to keep reading Freedom's Light to find out if Hannah turned out okay. 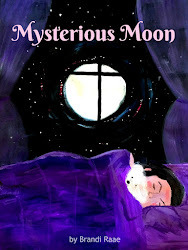 To find out if her light still shone at the end of the book. So much so that I stopped highlighting and taking notes to write a good review! I got busy turning pages instead of taking notes. I'm typically a fast reader, but I try to slow down for reviews. Sometimes that's just too difficult, especially when the book is more plot driven. I'm drawn to lighthouses and stories about them. I like historical fiction and stories set during wartime. I like suspense, stories of faith, and clean romance. I like sad mixed with happy. 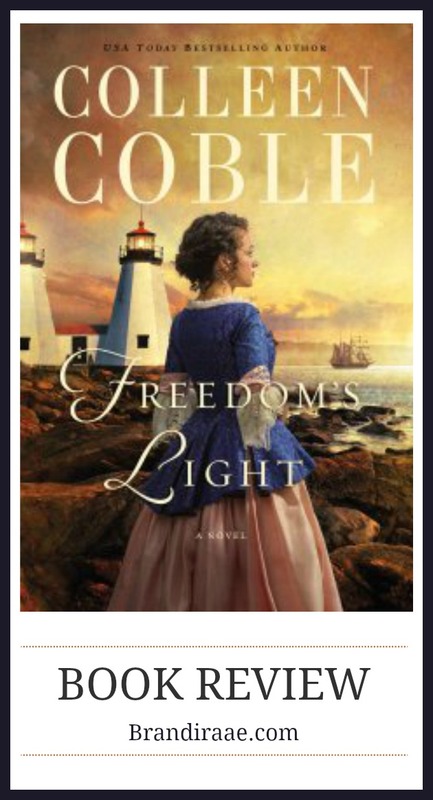 Freedom's Light has all of the above, and I recommend this book if you like these things, too.